Custom built closet solutions to decrease clutter and organize your life. High quality, custom stained/painted real wood cabinetry. Transform your cluttered garage into a organized, storage efficient space! Custom closets, pantries, kids closets, walk-in, reach-in, closet systems, shoe organizers, storage shelves, all custom built to fit your space. Closet organizers built using quality materials and construction methods making us the best and most affordable in the Puget Sound! Custom Wallbed / Murphy Bed and home office solutions. Dual purpose rooms to maximize your space. Utilizing the best mechanism and wood products available including custom stain and paint options. Custom sized garage cabinetry designed and built to your specifications. High strength and durable materials allow for storage of large and bulky items. Work benches, overhead storage racks, garage accessories and more! We're very pleased to have you as a visitor, and hope that the information and visuals here will provide you with enough information to choose us as your partner in design, manufacture, and installation of your custom organization needs. Our ever-growing variety of products and services are designed to provide as many solutions as possible for the home and office setting. The name "custom closet company" is really a misnomer and is no longer valid in today's need for more and more organization or closet storage space. We offer more innovative home storage solutions than just custom closet organizers. This includes; custom garage cabinets, laundry room solutions, home office organizer cabinets, entertainment centers, pantries, walk in and reach in closets—just about any space that needs to be organized. 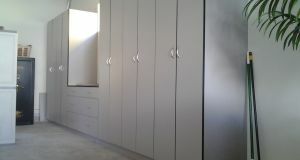 We also offer a wide variety of Wallbeds / Murphy beds and even small kitchen / vanity cabinets. We are your organization and storage experts for the greater Seattle, Bellevue, Tacoma, and Olympia areas. At Northwest Closets & Wallbeds, we have closet design specialists that cover areas of the puget sound ranging from Maple Valley to Tumwater, Issaquah to Redmond and even Snohomish. With our growing team and expanding business, we have the Puget Sound covered! We are a Non-franchise, locally owned and opereated company being run by the same family members that started the business in 1990! We offer affordable, quality closet systems, wallbeds/murphy beds and other cabinetry. Rest assured you wont be paying high franchise costs associated with competitors like California Closets or Closet Factory...try your local family owned company that offers superior cabinet construction and NO California prices! We focus our attention on the number one priority, the customer! We take pride in our customer service, attention to quality and details every step of the way. We get the customer involved in their design and listen to their feedback to create more than just closet shelving. With our no pressure sales approach, the customers have time to review and make an informed decision on their design and budget. Need a hands on visiual experience? Our showroom in Kent, WA offers several closet, wallbed and cabinet displays so you can see for yourself the difference in quality and process. We also offer a factory tour so you can see your project or others being constructed real time! Our showroom offers a home feeling and our employees are as friendly as your best neighbor. We are here to help you get the job done correctly and provide a service that would be hard not to recommend to your family and friends. If you have any questions that you do not find addressed on our website, feel free to contact us - we'll have an answer! "Garrett, we are so pleased with our new closets. The finished product is beautiful, installation was professional, and great follow up for the tweaks. We had several bids and yours came in as the best quote. Great work!" 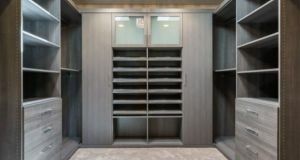 "I had a full remodel done on my condo and I will honestly say that Northwest Closets was the best. Garrett had a full crew come in to do installs on all my closets plus storage areas. They were efficient and friendly and did a wonderful job. This is a very professional company and I would recommend them in a heartbeat." "It was a pleasure working with Garrett to design and build our closets. He is very good at creating a design that meets our needs and budget. 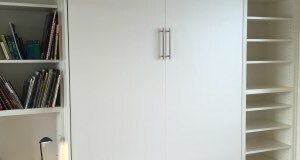 The closets are of high quality, looking great. His team was very professional during the installation."